woah! drool drool! what a lovely muffin! Muffin are addictive, love them. I like they way you dusted with powdered sugar. 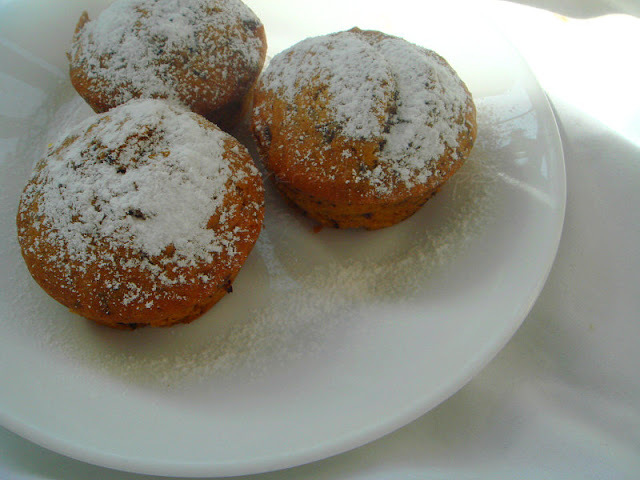 Muffins looks perfect and love the sugar on top. Haven't tried pumpkin muffins.The muffins look delicious and a healthy recipe.Will definitely give it a try. Great for the season, looks delicious with icing sugar! Love the simple powdered sugar for the topping! These look great! Love the dusting of sugar. Makes it look pretty. Muffin looks so soft and delicious. They look really nice, and healthy too! Looks just perfect and yummy.. Sounds healthy and delicious! Perfect for snacking! so cute they look so yum yum.I love the way they have come full round in shape.Can I have one please???? great and perfect looking muffins Priya! It's amazing that you were able to try two recipes for this month's challenge! Great job! Would love to try this yummy muffin. Looks so good... must try.. I would love one of these right now - dinner's done, I am sitting by the fireplace wanting something sweet!! !